The landlocked West African country of Burkina Faso is facing "unprecedented" displacement, triggered by armed groups and intercommunal clashes, and exacerbated by long-term food insecurity, UN aid officials said on Tuesday. According to the UN humanitarian coordination office, OCHA, more than 70,000 have fled their homes in the last two months. 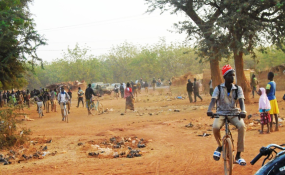 Reports indicate that armed groups have also burnt schools and killed innocent civilians. Increased insecurity, violence, a continuing food crisis, floods and epidemics are among the factors that have plunged Burkina Faso into a full-blown humanitarian crisis, with civilians traumatized after bearing witness to brutal attacks, and many have lost family members and most of their possessions, said an agency press release. OCHA's spokesperson Jens Laerke described a rise in intercommunal clashes since the second half of last year. "[These are] clashes between communities and armed groups which are fighting each other, fighting Government forces and attacking civilians. That really took off at the beginning of this year, there were some very violent clashes in the beginning of January", he said, briefing journalists in Geneva. On Tuesday, humanitarian partners said that US$100 million is needed to reach 898,000 people this year. Complementing this, the UN Central Emergency Response Fund (CERF) allocated $4 million to boost assistance to internally displaced people and host communities, and to also provide services for 15,500 women and girls. The UN's Deputy Humanitarian Coordinator, Ursula Mueller, who ended a four-day visit to the country on Tuesday, said that those funds will "make an immediate difference for displaced people, most of whom are women and children". Today, around 1.2 million people are in need of assistance in Burkina Faso's Sahel, North, North-Centre and Eastern regions. The $100 million appeal to assist 900,000 of those hardest-hit in the landlocked country is only 16 per cent funded, a month after it was launched. As international displacement rates continue to grow, the country is already hosting 25,000 refugees, most of whom are from neighbouring Mali, to the north, which has also been wracked by instability, extremist violence, and clashes involving armed groups. 93 per cent of Malian refugees depend on humanitarian assistance to survive. Ongoing violence has forced the closure of more than 1,100 schools, depriving around 150,000 children of education. Some 120,000 people have no access to medical care with many health centres shuttered or providing only minimal services. After witnessing first-hand the depth of the humanitarian needs, Mr. Mueller reiterated the importance of providing "shelter, water, food and healthcare timely and sufficiently" to thousands of families who continue to flee due to persistent insecurity. "Burkina Faso authorities and humanitarian actors have quickly provided assistance, however, more has to be done to meet growing needs of the affected people wherever they may be", she said, adding that the "neutrality of aid workers" must be respected. The UN agency stressed that more sustained funding is needed to ensure that people in the hardest-hit areas are reached with aid. Last year's Humanitarian Response Plan remained severely underfunded, with only 55.2 per cent of the requirements met.